Heatmap, Currencies - dashboards which show the relative strength of currencies. 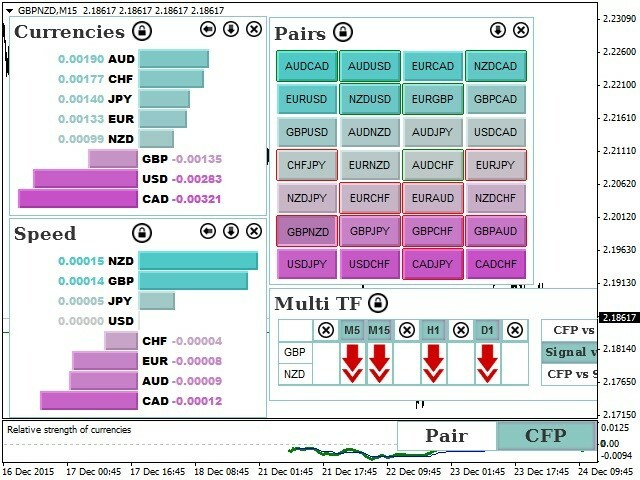 Pairs - dashboard which shows strength of currency pairs. 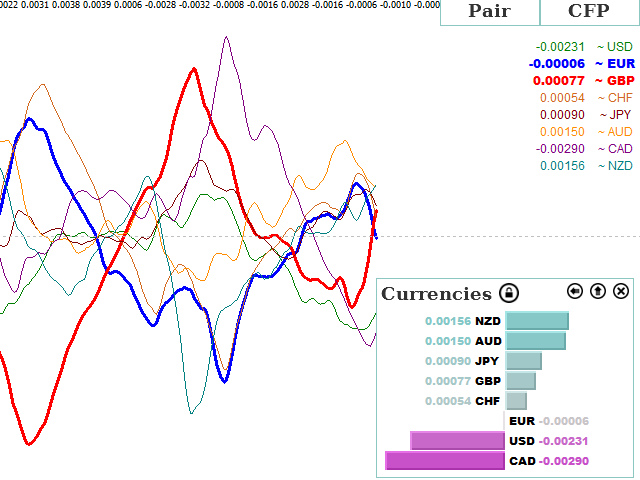 Speed - dashboard which shows speed of change of the relative strength of currencies. MuliTF - main dashboard which should be used for analysis.This panel displays the data from all periods. Find out more details about using cluster indicators here. 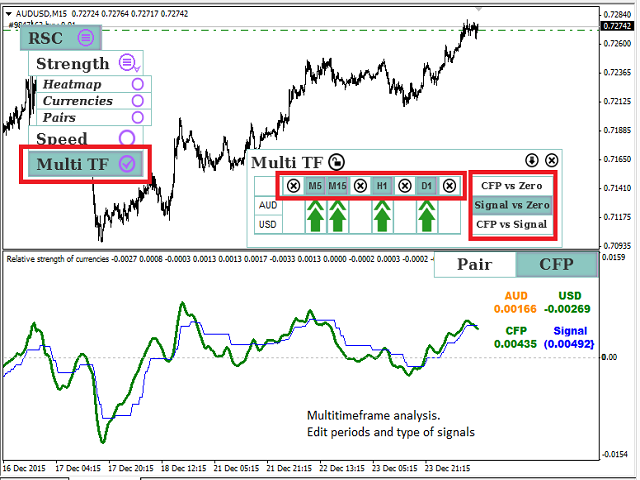 The indicator requires history for all timeframes (except MN1) of the current symbol, as well as of all major symbols: EURUSD, GBPUSD, USDCHF, USDCAD, USDJPY, AUDUSD, and NZDUSD. If you have received a notification requiring to download the entire symbol history, I recommend that you update history for all timeframes and re-launch the indicator. Bars for analysis - amount of bars for analysis. Do not set the value too high since this can significantly slow down the application. if Open new chart = true, the chart will open in a new window. Если Open new chart = false, the chart will be uploaded instead of the current chart. It may require a certain time.. 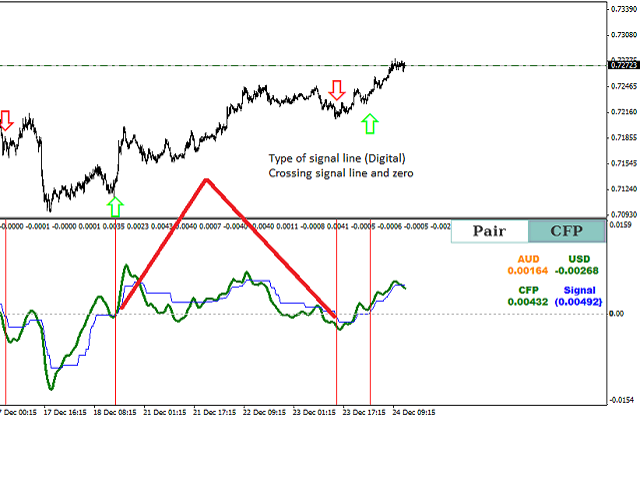 Currently signals and notifications may be obtained only for the current chart period. This panel displays the data lines of CFP and Signal Line of the specified periods. CFP vs Zero - It displays the data of CFP position relative to 0. CFP vs Signal - It displays the data of CFP position relative to Signal line. Data and periods are transferred to the Pairs panel. 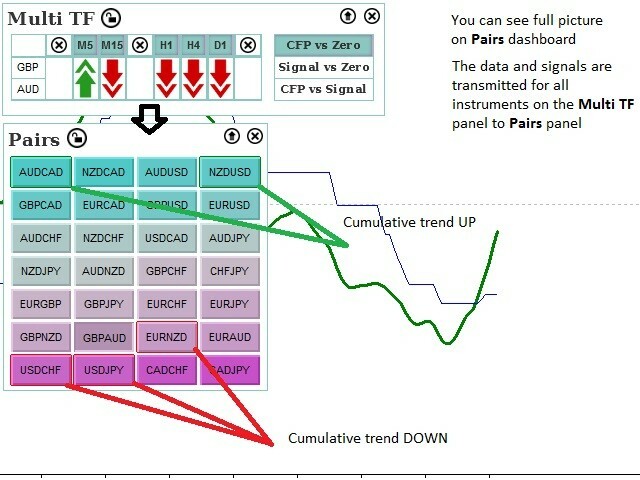 If all the selected periods have the same signals, the currency pair is highlighted in green (uptrend) or red (downward trend) color. Wow! Why I did not find this tool earlier? This is genius!!! I confirm the tool is very good. Personally i find it very informative in terms of recognizing ppairs with good potential. This is fantastic tool (and I have hundreds of them) to find and evaluate trades. Shows a lot of info and points out the pairs to trade. Been using over a month and it is well worth the money!!!! !